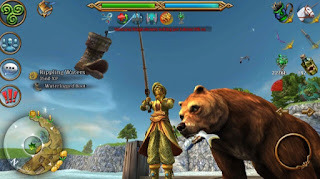 The Bear Taming ability is an ability that affects the Swipe skill of your bear, which lowers the catching meter of a fishing spot without affecting your Concentration. The higher the ability level, the more it lowers the catching meter. Train this ability by using the bear's skill. Each time you use it on a fishing spot, you have a chance to increase your Bear Taming ability. Obviously, use a Heroic Elixir of Wisdom. The only place to train it is on fishing spots. See the video below for a fishing tutorial, and an overview of all the fishing spots in Celtic Heroes. Where do I get a bear from? You get one from completing the quest given by the NPC standing beside the Highshore Village Dock. He asks you to obtain relic items by fishing for them, and in return he will give you a bear. Where do I buy bear food from? You buy it from the NPC next ot the Highshore Village Dock. Can I breed my bear?